-My first pick is a super simple side braid. Probably one of the easiest braids you can do! All you have to do is sweep your hair to whichever side you prefer, and braid away! What I like about a side braid is you can easily see all of your hair the whole time you are braiding. It’s a little harder to braid your hair straight back since you can’t see and just have to trust that it’s straight. 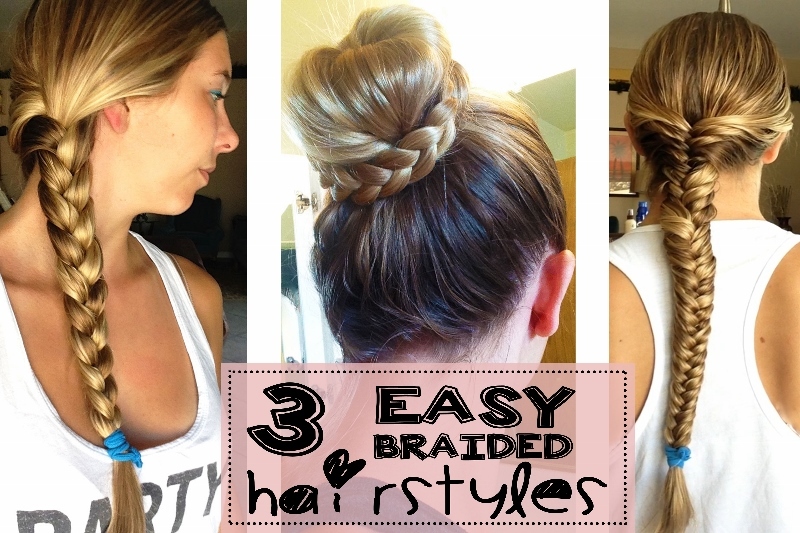 -My second favorite braided hairstyle is a braided sock bun. While sock buns can be difficult to master at first, I’ve found that practice really does make perfect! When I tried it with braids, I was hooked 🙂 Here’s a super awesome tutorial from C’erine Babyy I found so you guys can all try it at home! Helpful hint: secure your finished bun with lots of bobby pins. -My third braid is the ever-classy fishtail braid. This is probably my most favorite because it looks so much more complicated and elegant than it really is! You can wear it either straight down the back or pulled to one side. I’ve found that it’s much easier to fishtail my hair when it’s wet so that the little flyaways stay in place while I’m braiding. And the best part is that when you take it out, your hair will have a perfect wave with no hassle! When I was first learning to fishtail, I found this tutorial video by Lauren Conrad super helpful so I’ve attached it below 🙂 Helpful hint: try experimenting with smaller and larger chunks of hair to create different sized/textured braids. I hope you guys liked our first-ever tutorial! If there’s anything else you guys would like to see, leave a comment below 🙂 Stay tuned for most fun posts and Halloween-themed goodies!